The history of the Beach Boys is littered with unreleased and/or rejected albums that never made it to official status, though many of the associated songs found their way to the public. One such project has come to be known as Lei’d in Hawaii (get it?). In 1966, Pet Sounds was a critical (if not commercial) success, Good Vibrations became a smash hit and Brian Wilson was famously working on the Smile album. However, as 1966 turned into 1967, Smile kept getting delayed, the band (foolishly) withdrew from the Monterey Pop Festival and Heroes and Villains was a disappointment compared to Good Vibrations. 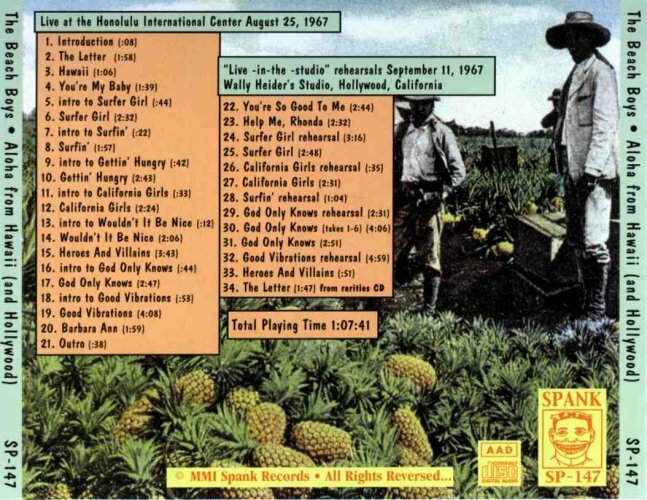 The Smiley Smile album (” a bunt instead of a grand slam”) barely dented the charts. Things had gone south for the band in America. Editorial comment – I like Heroes and Villains and there is some terrific stuff from the sessions that got left out. I think it could have been almost as good as Good Vibrations. 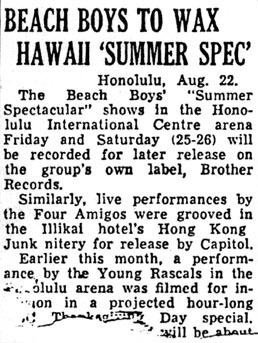 In 1967, the band went to Hawaii and recorded and filmed two concerts, which were to be edited to form a live album for Capitol Records. The cherry on top of the cake was that Brian Wilson, who didn’t travel with the group in those days, was present. 1964’s Beach Boys Concert album had been a hit and another live album would buy the group some time as they worked on a studio recording. They played shows on August 25th and 26th. Unfortunately, the band sounded disinterested and often, stoned, during the shows: more the first concert than the second. There is a noticeable lack of energy and the magic of several of the songs is completely lost in the understated performance. Mike actually whispers during California Girls, which is ridiculous. Brian refused to play the bass, sticking to organ, forcing Carl and Al to take on the task. Neither played the instrument regularly and they struggled some. As a result, this is a much inferior product in comparison to the double live album that was released a few years later, infused by the energy of Blondie Chaplin (and Ricky Fataar). It’s not a total loss. Brian’s falsetto sounds good on Surfer Girl. Bear in mind he wasn’t a part of the band’s travelling show back then and his voice wasn’t yet cigarette-scarred as it would become in the seventies. Al’s lead vocals on The Letter are strong and it’s a pretty good cover of the hit from The Box Tops. Mike’s backing vocals are weak, though. And the band sounds just fine on The Four Freshman a capella song, Their Hearts Were Full of Spring. And I’m always impressed with Al’s singing on You’re So Good To Me, a tune that doesn’t get the love I think it deserves. The boys sound pretty good on Surfin. Unfortunately, the overall effort suffers from lethargy and it’s a bit too slow. But on the whole, the performances were so poor that the group “re-recorded” the shows at Wally Heider’s recording studio in LA, with Bruce back on board (he didn’t make the Hawaii trip). After the songs were nailed down, crowd noise would be edited in, making it a fake live album. Even that didn’t go well and the whole project was scrapped. I am struck by how Mike Love’s banal banter, from the sixties through the 2000’s is so dumb and/or irrelevant. No exception here. He never seemed to understand his lack of skill as a front man. Here’s a link to the second (August 26th) show. 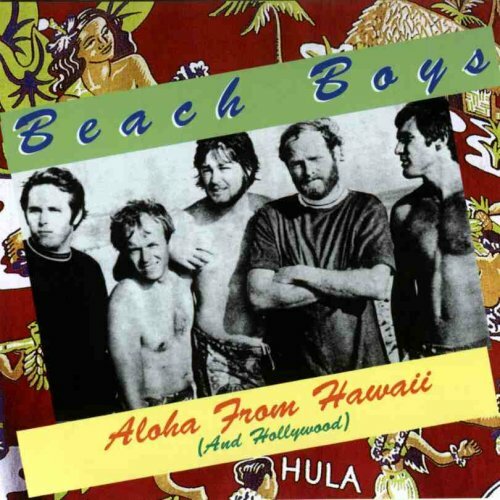 Scott G. has a bunch of really neat alternate Beach Boys albums he’s put together on his youtube site. Here’s his version of Lei’d in Hawaii. This entry was posted in Beach Boys and tagged Beach Boys on August 10, 2016 by Bob Byrne.